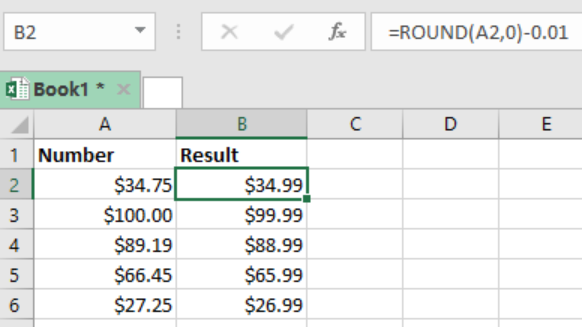 We can use the Excel ROUND function then subtract to round price to end in .99 value. This post provides a clear guide on how this is done. Step 1: Prepare your data, with Number and Result column. use for next in vba, the array declared PlayerPrice (99) but error inside for i = 1 to 99 subscription out of range? An Excelchat Expert solved this problem in 22 mins! I have a spreadsheet where a 'non-response' is auto added as a -99 figure, while all other numbers are between 1-7. 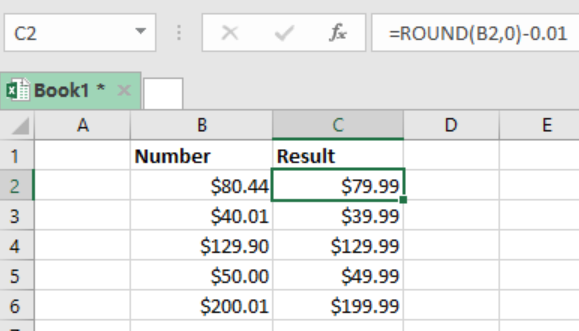 Given there may be a number of these in any given row/column which I need to discount from my average, and I need to know exactly how many in each line, is the a formula I can put at the end which identifies the number of responses '-99'? The data is presented in the Price sheet. Use the price data and a population standard deviation () of 0.113 to determine a point estimate for the national retail price of the product. Construct a 90% confidence interval to estimate this price. Round your answer to 2 decimal places.